NEWPORT NEWS, VA – The Newport News Green Foundation recently acquired its 21st property located at 5101 Huntington Ave. This .11 acre parcel is located at the corner of 51st Street and Huntington Ave. 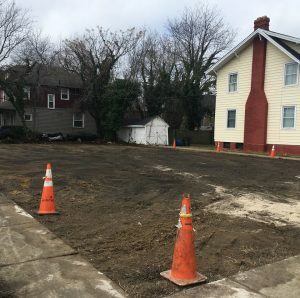 Originally a parking lot for the Newport News General and Non-Sectarian Hospital (later known as Riverside Hospital), the parcel was transferred from the city to foundation in March 2018. Interested community members can give input by filling out a short online survey, located at https://nngreen.com/5101-huntington-ave. Responses will be collected until August 1, 2018.